Monmouth Coffee aka REAL coffee. So in London, the peeps over at Which? 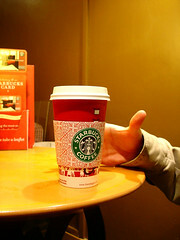 have finally worked out that chains like Starbucks have been offering the consumer ‘inferior coffee at inflated prices‘. Now tell us something we didn’t know. I admit to having fallen for Starbucks’ clever marketing strategies when they first arrived in Hong Kong – for a time, I’d drink nothing but caramel macchiatos and frappucinos, I’d never tasted a real espresso before in my life, and for my undeveloped palate, the sweet milky “coffees” served by Starbucks suited me just fine. I was never raised on coffee, but tea (that much is obvious), so the strong bitterness of espresso was never something that attracted me. Somehow, somewhere along the line I began to appreciate the brew a lot more. Maybe it was from working at the student union bar at my university – oddly, they didn’t make it compulsory for all staff to attend barista training (only about 6-7 of us went) – where I first learned the basics of making coffee. 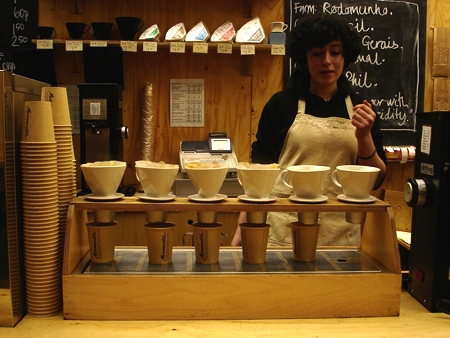 The trainer, a seasoned barista herself, was dead serious about coffee. We had an hour long seminar on the history of coffee, the do’s and don’ts of coffee making, and finally we spent another few hours getting to grips with the espresso machine and coffee grinder. At the end of the day, I’d made the perfect cappuccino that garnered a round of applause from our trainer and the rest of the group. Since then, I’ve never been able to forgive anyone for a poorly made cappuccino – it seems like most people think that its the same thing as a latte. L: Don’t do it! I still get sucked in by the ‘red cups’. Another thing I can’t stand about Starbucks is their ‘caramel macchiato’, which is basically a milk drink with oodles of caramel and about a drop of espresso. ‘Macchiato’, meaning ‘marked’ in Italian, the most common usage being in the drink ‘caffe macchiato’ – an espresso with a drop of milk or foam. It’s hilarious how Starbucks turns this right around and marks the milk with very little coffee and a mountain of caramel (if it were a ‘caramel macchiato’, surely it means to be marked with a bit of caramel, not an entire half-bottle?). I still stop by Starbucks occasionally for a quick drink, but it’s never on the merits of its coffee – I go when I suddenly need a sugar fix. I’m going to kick the habit this year, because thinking about how much milk and sugar are in its drinks makes me ill. Located in Soho (right across from Yauatcha), Flat White is one of the best destinations for a decent coffee. Care is given to both making it, and serving to the customer – the first time I went there I was momentarily baffled by the friendliness of the staff, who asked me for my name so they could write it on the cup. Somehow it seems so much nicer when they’ve prepared you your coffee and say, ‘Here you go, Charmaine!’ with a smile. I haven’t tried the signature flat white yet, but their latte was so decadent, creamy, and full of zing. 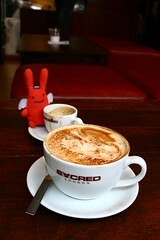 Located just off Carnaby Street, Sacred is one of my favourite places for a drink and a natter around the area. It’s particularly good in the summer, when you can lounge on the sofas on the ground floor, or the alfreso seating outside of the cafe, soaking up the sun. Their cappucinos may not be up to scratch (still too much milk, too little foam), but the coffee is acceptable and they’ve got a fabulous range for tea-lovers as well. The aboriginal/tribal artefacts that decorate Sacred are fun and give the place its very unique kind of atmosphere. A lovely couple, Rob and Thuyen, bring their love of Vietnamese coffee to the East London community. They set up stall every week at Broadway Market, selling classic Vietnamese brews as well as more unusual drinks such as artichoke tea (which I haven’t had the courage to try yet). 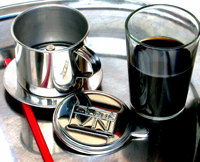 Vietnamese coffee is a result of French colonial rule, and so uses French coffee beans. Ground and placed into a unique metal coffee filter, where the espresso drips slowly through – the resulting espresso is extremely strong, though the strength is offset by sweet and creamy condensed milk. A perfect pick-me-up, especially in the winter cold. I bought one of their single-cup coffee filters (extremely cheap!) and a bag of ground coffee (from Buon Ma Thuot) so my dad and I have been enjoying many a Vietnamese coffee here in Hong Kong. You can find their wares at the Algerian Coffee Store in Soho, or can order online at the Ca Phe VN website, alternatively there are many other stores listed in their stockists page. Ca Phe VN, Broadway Market, E8, London. Open every Saturday 9am-5pm.